Decks provide an excellent outdoor space for family gatherings and cookouts, and many families spend much of their time at home during the warmer months enjoying their deck. While decks are great gathering spaces, they are subject to wear over time. After time, many decks are in need of basic repairs, and sometimes decks need major repairs to ensure they maintain their structural integrity. Some deck repairs are minor but important. Things like rusted screws and loose bolts need addressed before they become major problems. Likewise, nails and screws may loosen and the boards give and detach over time. If you have major deck repair needs, they may require that several damaged boards be removed from your deck and replaced. For other areas, portions of the wood may need to be removed and the space filled with special wood repair agents. 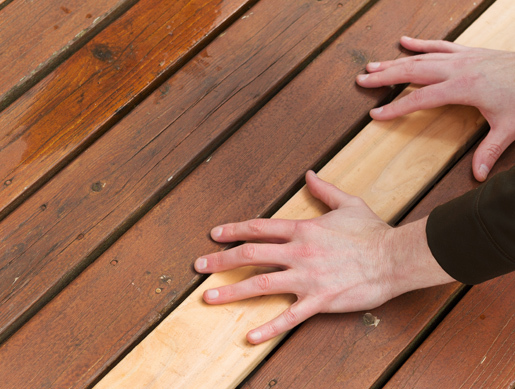 Minor and major deck repair projects can be burdensome and time-consuming for many homeowners. When you need experts at deck repair, call on the craftsmen at Sears Handyman Services. Our teams of professional handymen can repair decks as well as build them. If you have an older deck or one that was not originally stained properly, you may have more serious problems requiring additional repair services. If you see discoloration among the wood flooring on your deck, this is likely a sign of water damage or wood rot. Wood rot occurs when wood has been exposed to water for prolonged periods of time without having first been treated to prevent water damage. 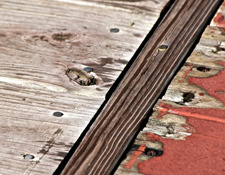 Wood rot leads to discoloration and also to soft spots in the deck, which could crack or break if the problem is allowed to persist. 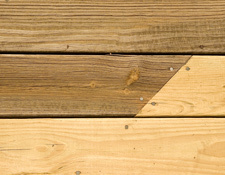 Sometimes wood deck boards shrink over time, causing small or large gap between the boards on your deck. Whether you need a few minor repairs or major deck renovations to solve problems like wood rot, a Sears handyman is on the job. 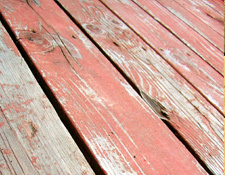 Call today to discuss your deck repair project.